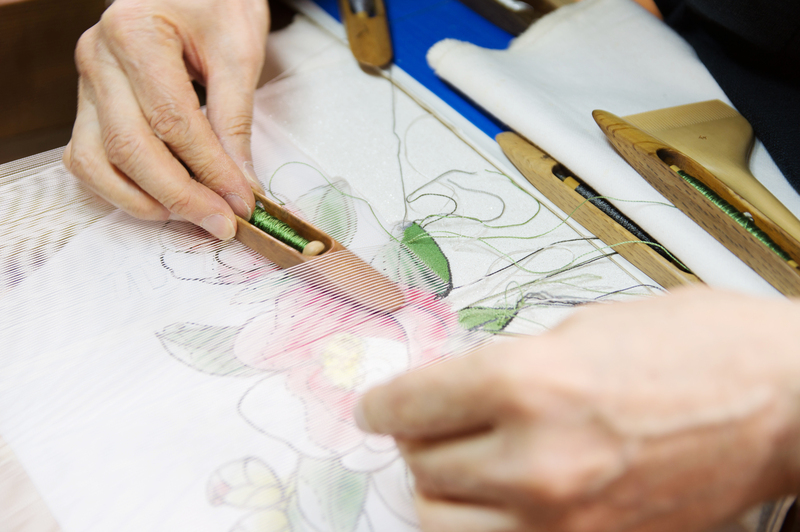 Become a fan of Tsuzure-ori tapestry weaving by meeting and talking to Kikuo Hirano, the distinguished expert in his field decorated with the Order of the Sacred Treasure Award! Observe how Tsuzure-ori proficient craftsmen provide their time, effort and color arrangement skill for the sake of creating the woven works of art with their nails. Patterns are woven using traditional technique called “Tsumekaki”, when artisan sharpens his fingernails into a saw teeth shape and uses them like a comb to create a relief brocade pattern. This technique is very advanced and time consuming, sometimes one whole day can be spent to weave only 1 centimeter of textile, depending on the type of brocade. Offer yourself an opportunity to watch a demonstration of this valuable craft and learn about Tsuzure-ori directly from the artisans.